Furutech FPX Cu - $69.99 Furutech FPX Gold - $94.99 Furutech FPX Rhodium - $119.99 Furutech GTX-D Gold - $144.99 COOKED Furutech GTX-D Gold - $169.99 Furutech GTX-D Rhodium - $249.99 COOKED Furutech GTX-D Rhodium - $264.99 GTX-D Rhodium NCF - $279.99 COOKED GTX-D Rhodium NCF - $294.99 Furutech 102D Stainless Plate - $35.99 Furutech 102-2D (dual duplex) Stainless Plate - $52.99 Furutech 104D Carbon Fiber Plate - $119.99 Furutech 105D NCF Carbon Fiber Plate - $219.99 Furutech GTX Receptacle WALL FRAME - $159.99 NCF Outlet, NCF Cover, GTX Frame - $528.00 / pkg. NCF Outlet, NCF Cover, GTX Frame COOKED - $543.00 / pkg. Furutech FP-209-10 mini spade Gold - $3.99 ea. Furutech FP-209-10 mini spade Rhodium - $4.99 ea. 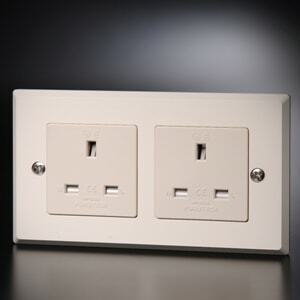 If you're tired of other "high-end" receptacles chewing the plating up on your connectors, and don't want to spend a fortune, the FPX series represents incredible value: The unique blade insert construction ensures increased contact area, and a nice, tight grip. 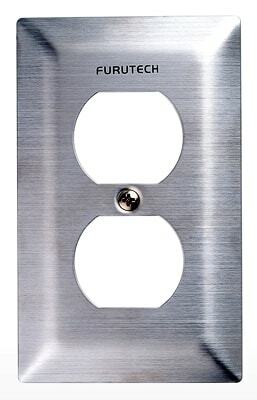 With completely non-magnetic construciton, the Furutech FPX series is available with unplated (Cu), gold (G) or rhodium (R) platings, and will accept either 15a or 20a male blade configurations. 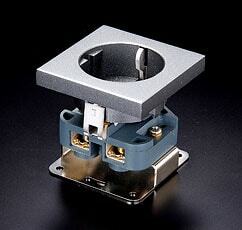 Accommodates conductor diameters up to 10 AWG. *** The GTX series is also available with optional 5 day conditioning on a cable cooker! NEW ITEM! The NEW Furutech GTX NCF incorporates Furutech's new Nano Crystal Formula, and will be offered alongside Furutech's existing GTX series. 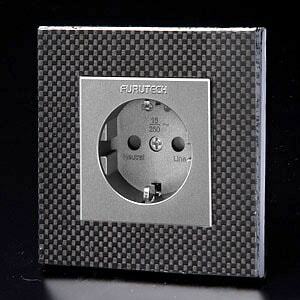 The new 104-D carbon fiber receptacle cover and GTX Wall Frame are excellent additions to the Furutech lineup, and has some serious "bling" factor, as well as functionally improving resonance control for your AC receptacles. The perfect mate for the GTX series. 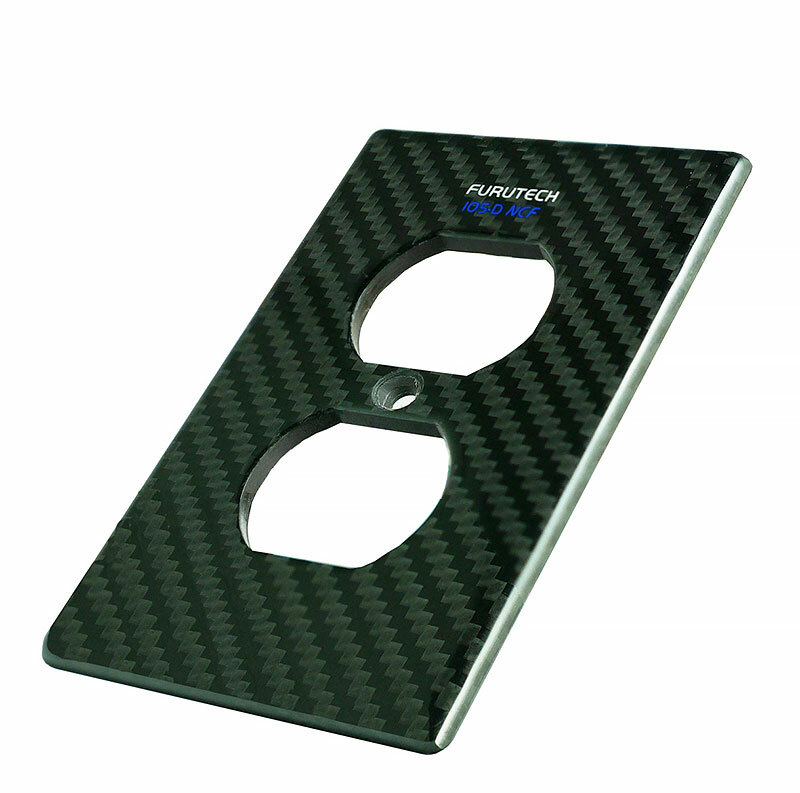 More information may be found here: 104 Carbon Fiber receptacle cover and here: GTX Wall Frame . Here's what the Furutech GTX receptacle, frame, and 104D cover look like, when used together. NEW ITEM! 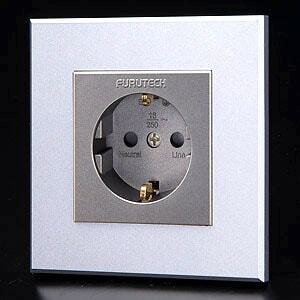 Furutech has just introduced it's new top-of-the-line Furutech 105D NCF Neo Damper Outlet Cover. The 105D NCF is non-magnetic, and is finished with NCF (Nano Crystal Formula) carbon fiber sheet, Neo Damper sheet, and NCF resin plate. NEW ITEM! Oyaide (pronounced "Oh-yah-ee-day") is the new kid on the block, with their AC power connectors and receptacles. One look at these confirms the Japanese obsession with quality materials and workmanship. Oyaide receptacles are among the best AC receptacles on the market today, with special attention paid to the polishing and plating processes used. 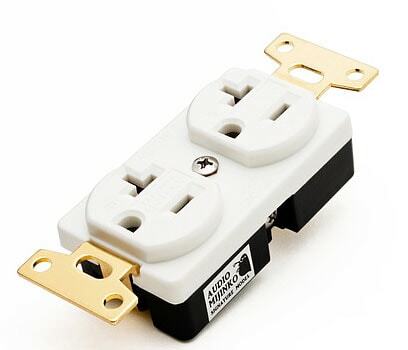 Oyaide AC receptacles also have a "dimple" on the neutral contact that mates perfectly with the hole you find on the neutral blade of a male AC plug. 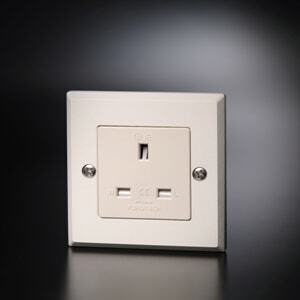 This means even more contact surface area, and a fit/finish more like a SWiss watch than an AC receptacle. Nice. Available in several different plated versions. The new Oyaide R1 receptacle is the "cream of the crop". 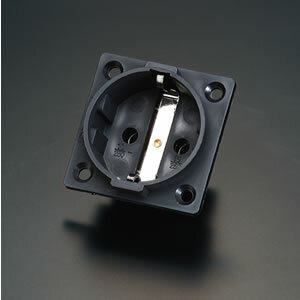 ALL RECEPTACLES, Including the Oyaide R1 and (unplated R-0) ARE IN STOCK AND READY TO SHIP!!! *** Oyaide R-0 and R1 are also available with optional 5 day conditioning on cable cooker! FREE Deep Cryogenic treatment upgrade on all Oyaide receptacles. 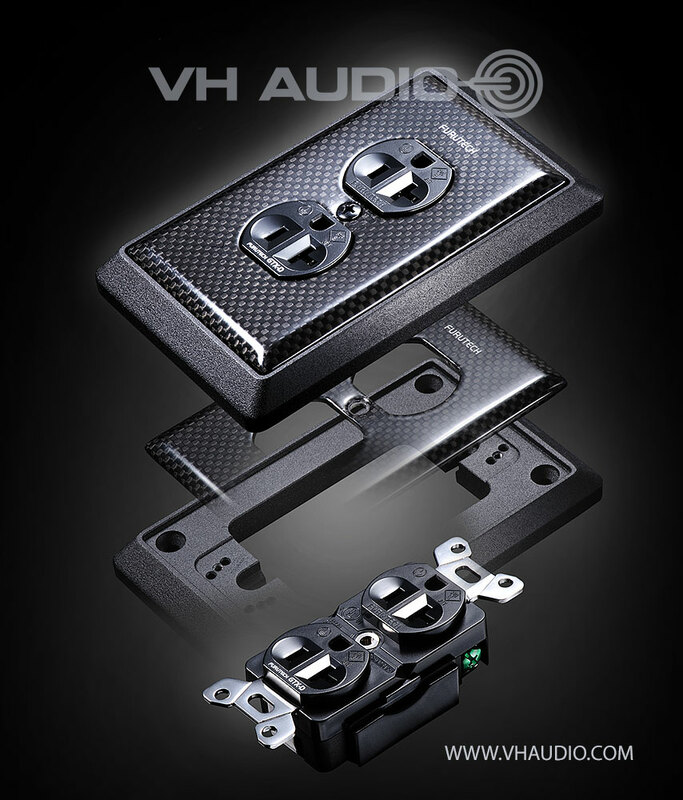 Oyaide WPC-Z - Carbon fiber/aluminum faceplate for Oyaide receptacles. 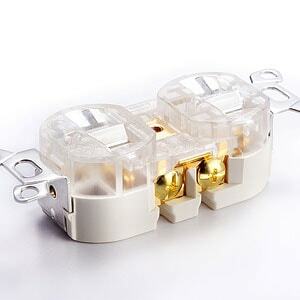 The Synergistic Research TESLA Plex SE is a 20A duplex AC receptacle / power outlet that uses a Quantum Tunneling treatment: a process that changes the way a conductor works at the sub atomic level, impacting the entire TESLA Plex SE AC receptacle assembly. 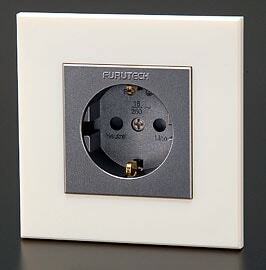 By applying a two million volt signal to each receptacle, at a specific pulse modulation and an ultra high frequency, for an exact duration of time, the outlet is transformed at the molecular level.